Nothing proves the depth of the wellspring of Irish traditional music these days than the annual awarding of the TG4 Gradam Ceoil Awards by the Irish language television channel announced last month. Since they were first were given out in 1998, many of the outstanding traditional musicians in the contemporary era have been recognized in one category or another. The 2013 honorees are once again a bumper crop of very deserving people who have exhibited not only talent and commitment to the traditional arts, but also the passion that has won them respect by the peers and the audience alike. All will receive a special John Coll sculpture and a monetary gift at the annual Gradam Ceoil Concert slated this year for Easter Saturday night, March 30, at the University of Limerick Concert Hall. At the very top of the list is the Traditional Musician of the Year presentation to Dermot Byrne, a native of Buncrana, the button accordion wizard who has been a regular member of Altan since 1994. Byrne was reared among many legendary musicians in Donegal who inspired not only his own repertoire but also the spirited and lively music that infused the Altan catalog now made famous around the world. From an early age, he established himself as a craftsman on the box playing with great sensitivity and style which especially came to the fore on the CD released last year with French harpist Floriane Blancke with whom he toured here last summer. Another Donegal legend in fiddler Tommy Peoples from St. Johnston was recognized as the Composer of the Year (He won Traditional Musician of the Year Award in the very first year of the Gradam in 1998) for his numerous compositions that reveal his inimitable style of playing that has captivated and entertained musicians and listeners for years. Anyone who has followed the outstanding career and contributions of the Clare-born flute player Michael Tubridy knows the Lifetime Achievement Award suits him down to the ground. From his formative years in Kilrush taking in house dances and the music of Mrs. Crotty, the famed concertina player from the Banner, he has excelled on the whistle, flute and concertina as well as a set and sean nos dancer all his life, and he’s a professional civil engineer too. In the 1960s he was a member of the Castle Ceili band, Ceoltoiri Chualann, and the Chieftains and Connie Ryan’s Slievenamon Set Dancing Club in the 1980s and ‘90s sparking the set dancing revival. Anyone who heard him last year on a brief tour of the Northeast U.S. saw a fitting example of why the gentle and humble musician is a worthy recipient. U.S. audiences in recent years have seen more of the Dingle musician Seamus Begley, who won the coveted Singer of the Year designation from TG4 on his tours with Oisin MacDiarmada in both Teada and as a duet act, releasing a CD, Le Cheile, last year. 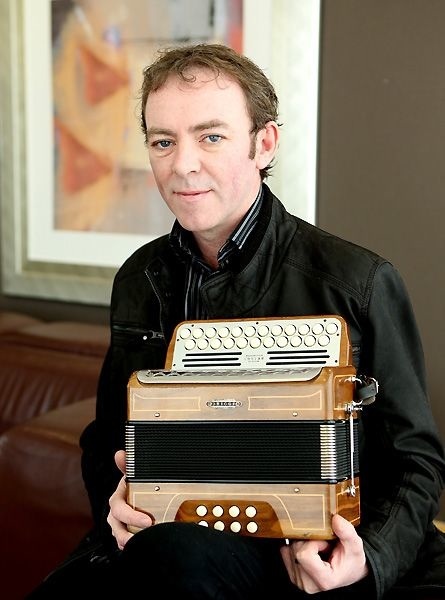 Also a fine accordion player and humorous storyteller from a prolific musical family in West Kerry, his tender singing in the Irish language as well as English has delighted audiences everywhere, and Begley has many fine recordings to his credit. There is much you could say about the Na Píobairí Uilleann (NPU), which was founded in 1968 to help salvage the future of the Irish uilleann (elbow) pipes which was in grave doubt at that time as the number of pipe makers and musicians were at a low ebb. Forty-four years later, thanks to their extensive efforts, there are now thousands of people playing the uilleann pipes. Two years ago NPU launched a pipe making initiative called Pipecraft to encourage their manufacture to help meet the growing demand for the complex instruments. Along the way they encouraged the set dancing revival through the introduction teaching tools like books and recordings, and provided many opportunities for piping classes, teachers and concerts. With considerable support from the Arts Council in Ireland, they maintain a state of the art headquarters at 15 Henrietta Street in a remarkably restored Georgian building north of the Liffey with plans to expand next door for a museum, theater and visitor’s center. TG4 is lauding them for their special achievements in preserving and promoting Irish music. Last and perhaps most importantly, TG4 recognizes a promising musician with its “Young Musician of the Year” award carrying a stipend of €2,000. Donal McCague, a 22-year-old fiddler from Scotstown, Co. Monaghan, is no mere up and coming musician but already very accomplished -- as is usually the case in this category -- with his own CD released in 2011 and more than a decade of solid musical expression that is well recognized throughout Ireland. The world of traditional music owes so much to Dermot Byrne, Tommy Peoples, Michael Tubridy, Seamus Begley, Donal McCague and NPU, and kudos to TG4 for saluting them this year. The concert will be recorded for airing on Easter Sunday, March 31 at 9:30 p.m. (Irish time) and available for viewing for 35 days afterwards at TG4.ie.